Fell Beck could be just any other stream, gathering water from a large catchment comprising the south-east slopes of Ingleborough and Simon Fell. As it reaches the Great Scar Limestone, it cuts through a layer of glacial drift to form a narrow trench, 10 metres below the level of the moor. Some of its water sinks into the many and varied fissures its rocky bed – but then suddenly and dramatically – all normality ends. The entire stream meets the funnel-like end of the blind valley and promptly vanishes down a black void, 20 metres long and 10 metres wide. There is no surrounding fence. No danger sign. No warning. This is nature at its most brutal; putting Ingleborough, unquestionably, in a league of its own. The point at which the water vanishes has been governed by a fault . This has wrenched the rock strata and enlarged existing fractures, creating a convenient weakness for the mildly acidic water to exploit. Fell Beck falls 340 feet to the cobble-strewn floor of an enormous Main Chamber: 140 metres long, 27 metres wide and 34 metres high. 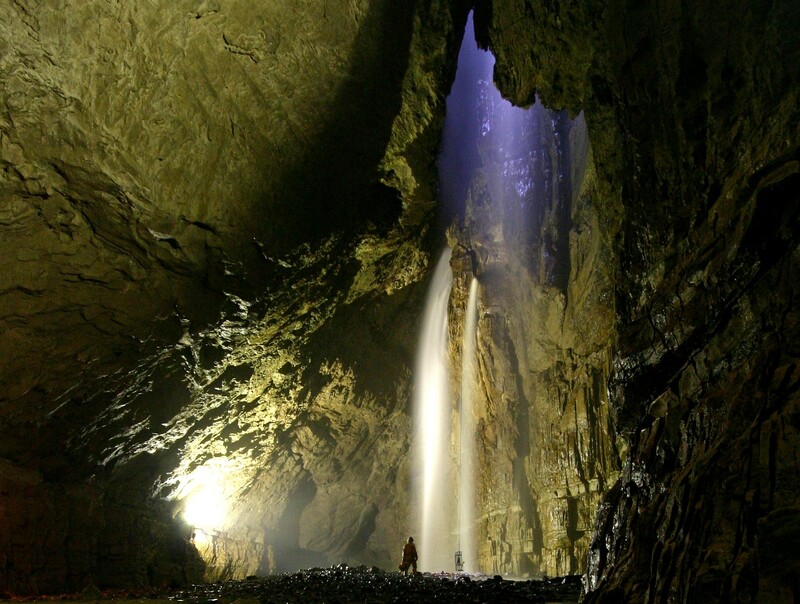 This is the largest and most impressive cavern in the British Isles. 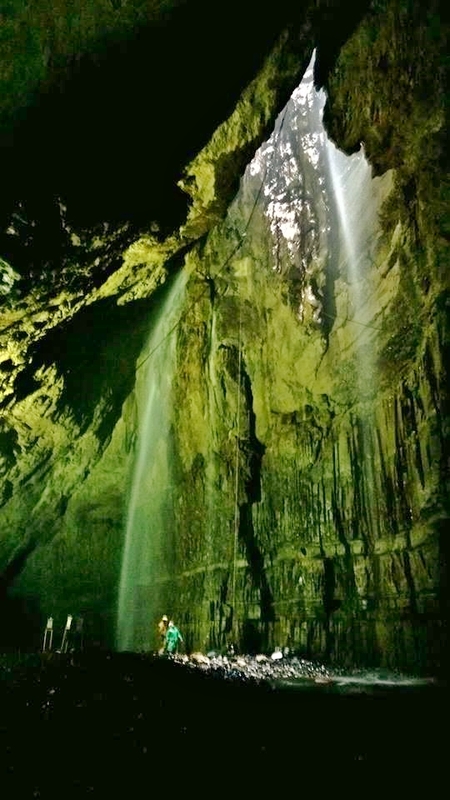 Air drawn down the shaft by the plumes of cascading water makes the chamber perpetually draughty – earning it the nickname ‘Hall of the Winds.’ It is a truly awe-inspiring place – and first time visitors who have taken advantage of the spring and summer winch descents, are likely to be overwhelmed by their surroundings. The north wall of the chamber sees three cascades competing with each other as they vanish from daylight. 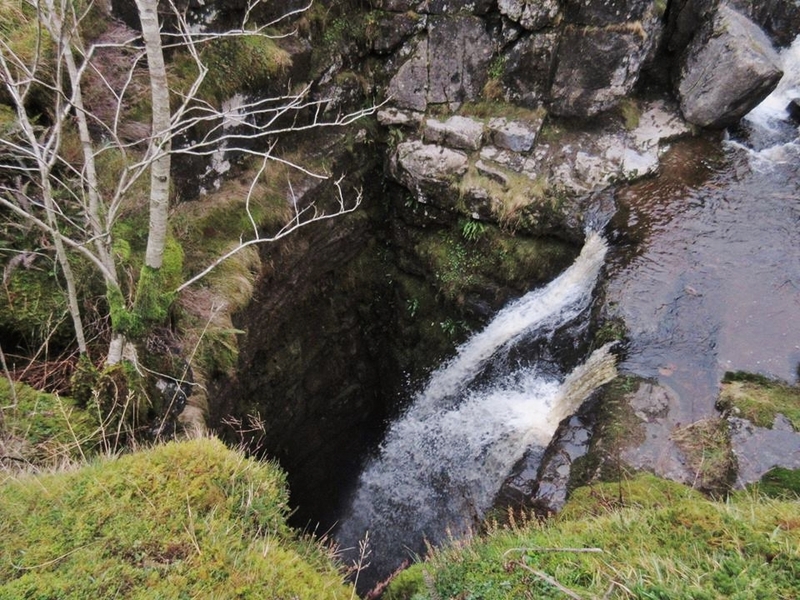 The western cascades fall down fissures in the floor of Fell Beck just before the Main Shaft, and one can claim to be the highest unbroken waterfall in the UK. One fissure, hidden by behind a boulder in the stream, should not be entered as it leads to greasy wooden beams protruding over the full drop to the chamber floor. Here, inside ‘Jib Tunnel’, the early winch descents were made before being developed over the Main Shaft itself. The eastern cascade, straight down the open hole, is actually broken as it deflects off Birkbeck’s Ledge, 50 metres down. This is the point reached by Settle Farmer John Birkbeck in the nineteenth century, before a fraying rope thwarted his attempt at making history as the first man to descend the shaft. During the winch meets by the caving clubs in May and August, much of the water is diverted down another fissure in the stream bed, ‘Rat Hole’ which reduces the chance of a major soaking for those descending. The Main Chamber gives ample evidence of the fault that encouraged its development. The north wall, behind the cascades, is mostly vertical, while the opposing south wall leans over the chamber at an angle, giving the impression of being inside a gigantic loft. This angle has been caused by the wrenching and rotation of the fault, and there are further clues to this ‘rocky’ activity. 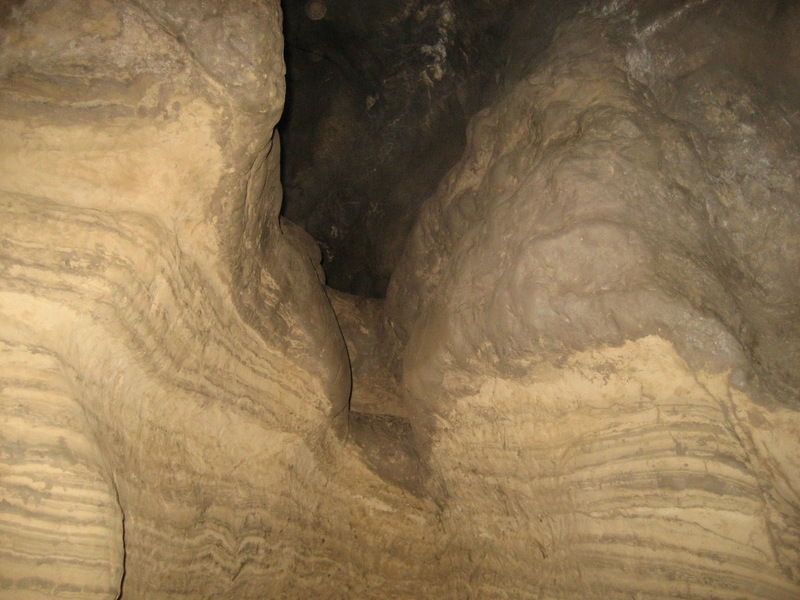 A distinctive pale ‘dado rail’ of limestone can be seen running along the walls of the chamber at a height of between 6 and 8 metres from the floor. This is the well-known Porcellanous Band – a type of finely grained limestone that was probably laid down in a very shallow lagoon during a time of lowering sea levels. 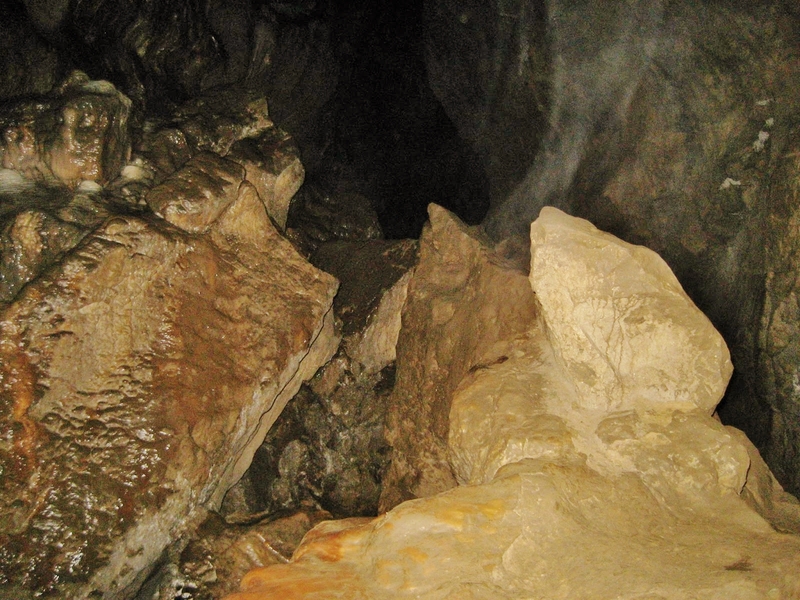 The band, which obviously pre-dates any cave development – is up to 4 metres higher on the south wall, and this can be seen by walking to the east end of the chamber and comparing both sides. The west side, however, shows no difference in height. This shows that the fault’s main wrenching and rotation was centred on the current south-east corner. Here too, in the north-east wall, can be seen ‘slickensides’: areas of crystalline rock showing dipping striations from the grinding as the two planes of the fault pushed against each other. The base of the Main Chamber is a false one, as some 30 metres of cobbles, boulders and glacial sediments are estimated to lie above the actual floor itself. Beneath, water escapes towards Clapham Beck Head, though the outlet is unreachable. A ton of ammonium salt poured into Fell Beck in 1900 emerged five days later at the resurgence, indicating the constricted nature of the passages beneath the floor – though flood conditions reduce this to a few hours. Only a combination of traversing dry passages and entering flooded rifts has made the through trip possible, and this was first achieved in 1983 – though the link has since shingled up. Leading off the Main Chamber, there is a fascinating labyrinth of largely fossil passages. A ladder above the east boulder slope leads into Old East Passage, with many attractive though now largely muddy formations – and the sudden drop into the immense Mud Hall. 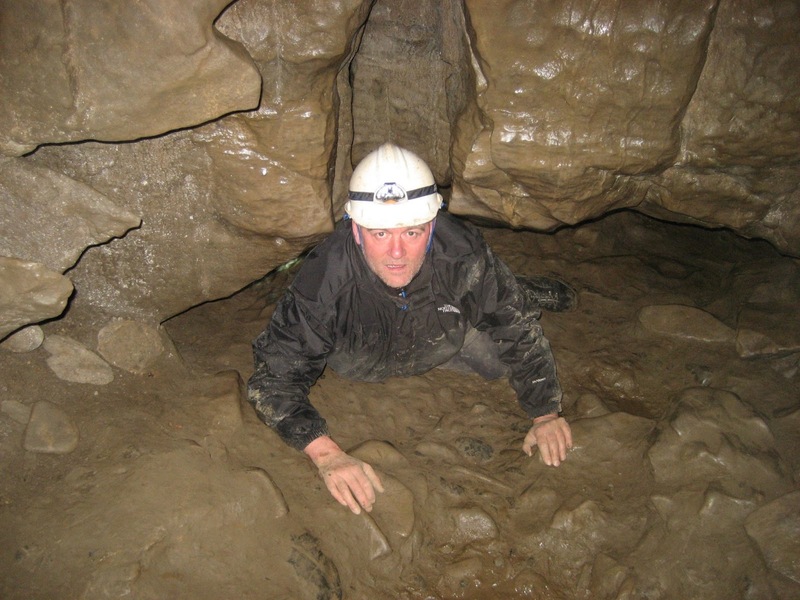 This can be traversed (experienced cavers only) on a ledge, and a further series of muddy passages lead to a maze of aqueous links below Clapham Bottoms, to the east of Trow Gill. An easy climb up into South Passage directs the explorer through a magnificent abandoned phreatic tunnel with a floor of hardened glacial sediment, passing under the Portcullis towards the eerie atmosphere of Sand Cavern and beyond. A link just inside the passage connects with the notorious Hensler’s crawls – and a book could be (and has been) written on the wealth of passages and possibilities that lie in this ancient and fascinating system. 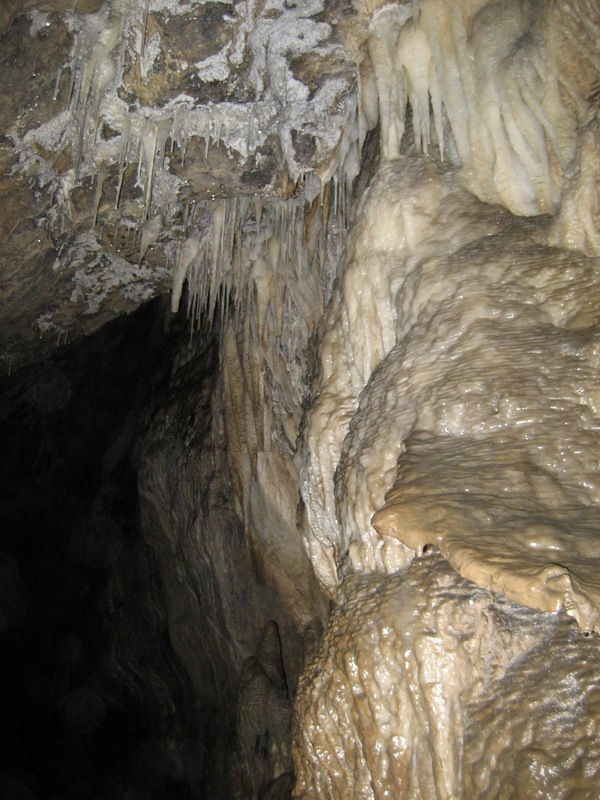 Most of the passages carried water well before the last glaciation and beyond, with some stalagmites dating back 350,000 years. They will have carried water from a much shallower main chamber when the water table was higher and most of the inflow had not yet found its way through the boulder floor. Several other entrances connect with the system. Disappointment Pot (SD750726) named for its initial potential route being blocked by freezing water, links though to the Far Waters below Clapham Bottoms, while Flood Entrance Pot (SD751724) leads via a series of pitches into the South-East Passage. The collapse doline of Bar Pot provides the most popular way in – though all three are for experienced and well-equipped cave explorers only. 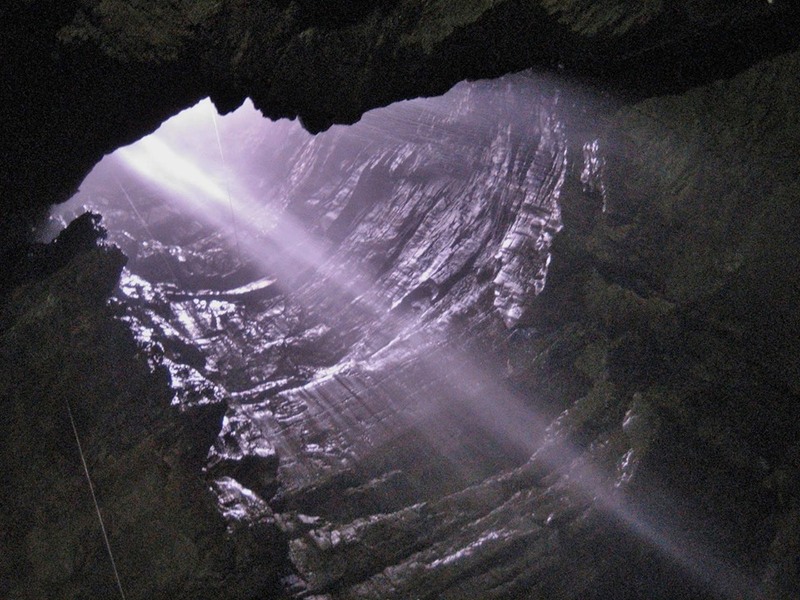 Gaping Gill never fails to enthrall. Its mere existence elevates an already fine mountain to legendary status.